MLS and the MLS Players Union finally struck a deal for a new Collective Bargaining Agreement on Saturday. The new pact offers positives for all parties, according to Kyle McCarthy. Banish the term “work stoppage” from your vocabulary for the next five years. Labor peace has finally arrived. MLS and the MLS Players Union reached an agreement in principle to sign a new Collective Bargaining Agreement on Saturday after two lengthy days of tireless work in Washington, D.C. closed the gaping chasm ready to delay the start of the season. 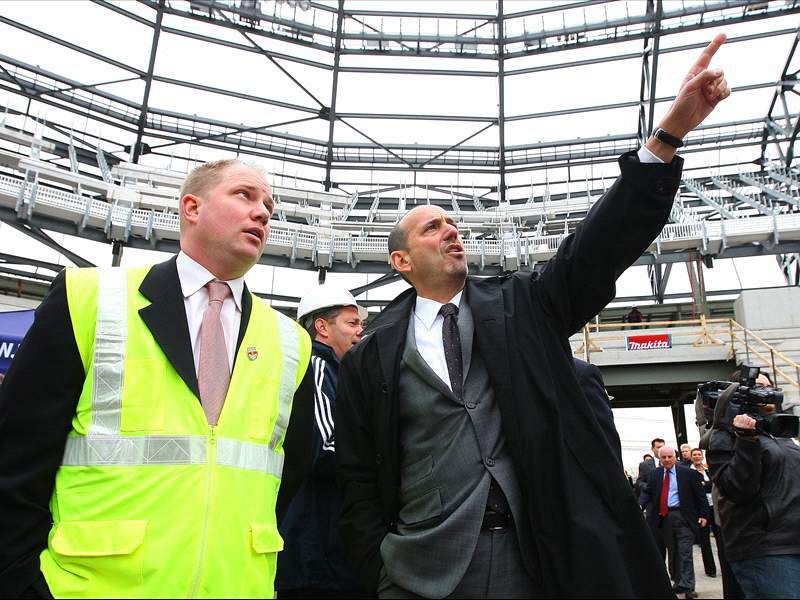 While the formalities of securing approval from the MLS Board of Governors and the Union rank and file await in the coming days and weeks, the new deal signed by MLS commissioner Don Garber and Union executive director Bob Foose early Saturday afternoon will bind the two parties together until the end of 2014 once formally approved. Details remain scarce as news filters outwards from a group that spent most of Thursday and Friday cloistered away trying to reach the long-awaited deal. Even without the nuts and bolts in perfect order, the broad brushstrokes reveal this agreement contains a bit of something for both sides. MLS maintained its single-entity structure without compromising its core principles. Free agency remains a distant pipe dream for the players, though the league permitted some internal freedom of movement by agreeing to the Union's proposal of a yet-to-be-defined “re-entry draft” for out-of-contract players. League officials handed traction to the Union in other areas – player salaries, for example – where they were plenty willing to find common ground and even assented to changes in at least one department – wider access to guaranteed contracts – where they weren't as keen to allow the Union to grab a foothold. The concessions facilitated the present deal while ensuring the overall structure would not fall under threat in the short- or medium-term future. Most importantly, the league can now focus on the opening weekend of the campaign, although in a rather abbreviated and rushed manner considering the season opens on Thursday. The worries about a strike sidelining Philadelphia's big debut in Seattle or wiping away New York's first competitive game at Red Bull Arena (a palace, if the television views from Saturday night are any indication) on Saturday night can now dissipate safely. In a World Cup year steeped with expectations on and off the field, this is a significant relief. As for the Union, the new deal yields substantial, if incremental, growth from the previous CBA. The Union reiterated its desire to increase player rights time and again and this pact includes provisions – extending guaranteed deals to players who meet certain age and service criteria, limiting the amount of unilateral options included in a contract along similar lines and persuading the league to bite on the “re-entry draft”it proposed to end the option snafu for veterans – to ensure the final product reflected its emphasis on those goals. In addition to those fundamental improvements designed to aid veteran players, the Union also obtained a pay increase for those players located at the lower end of the pay scale. Moving forward represents the most important step for a Union still smarting from the previous CBA negotiations. The Union benefited from broad cohesion within its ranks, deft leadership and substantial gumption this time around and reaped the results from sticking to its principles. Cobbling together those three factors made this instance of the Union a considerably more familiar foe than the nascent group that agreed to the first deal in the wake of a damaging legal setback in Fraser. This pact isn't an ideal one by any stretch from the Union's perspective, but it does lay the groundwork for the future. Much of the credit for constructing the groundwork for the new CBA falls at the feet of mediator George Cohen. The director of the Federal Mediation and Conciliation Service guided the sides through talks over the past couple of weeks and ultimately helped to broker the deal formed on Thursday and Friday. Deadline pressures certainly played an integral role in bringing both sides to the table and forcing them to accept the realities posed by the opposing viewpoint, but Cohen kept them there and kept them talking until a deal could be reached. Many questions still remain about the particulars of how that gap will close. General managers and technical directors around the league will wait to hear how much the salary budget will increase – some teams will need the room, while other sides will now perhaps have the flexibility to make a significant move – and how the new deal will otherwise affect roster flexibility even though the current allotment of 24 players remains the same. Players will want further details from their Union reps about how the new deal impacts them and their paycheck. Many of the important, nitty-gritty points have yet to reach the public (or, perhaps, even reach the stage of permanency), though the specifics will emerge as both sides push the new agreement to a vote. The most important point remains crystal clear even in the current murkiness. MLS will start its 2010 season on time and with its investors and players relatively content after a healthy dose of labor strife. Given the uncertainty weighed just a mere few days ago, those statements make the new CBA a considerable success at first glance. Kyle McCarthy writes the Monday MLS Breakdown and frequently writes opinion pieces during the week for Goal.com. He also covers the New England Revolution for the Boston Herald and MLSsoccer.com. Contact him with your questions or comments at kyle.mccarthy@goal.com and follow him on Twitter by clicking here. For more on Major League Soccer, visit Goal.com's MLS page.